For anyone thinking of building a homemade toboggan, odds are concrete is not on the list of supplies, but for group of engineering students it is the most important ingredient. Sixteen engineering students at the University of British Columbia's Okanagan campus have accepted the challenge of using concrete to make the runners of a toboggan and will take their creation to the Great Northern Concrete Toboggan race in Calgary Feb. 8-12 to prove their toboggan is the best. Team Captain James Lowe says the idea is to use sustainable concrete in the runners, meaning the concrete has to contain recycled waste materials. Lowe says the idea behind the contest has always been to push engineering students to design environmentally friendly concrete from a variety of industrial waste materials. The idea was born out of the Great Concrete Canoe race held in the United States. But the organizers wanted a Canadian flair, so they decided to design toboggans and race them in what is typically the coldest month of the year. Teammate Chris Dutil says the toboggan race has was first held in 1974 and attracts entries from engineering schools across Canada including McGill, McMaster, UBC, University of Toronto and others. Dutil says some 400 students from 15 universities will compete in the event that will see which toboggan can go the fastest. 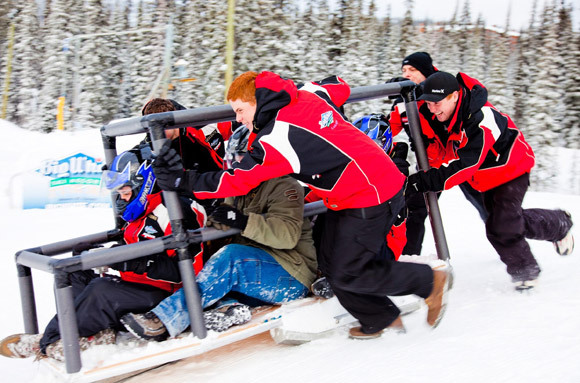 Each toboggan must weigh less than 300 pounds, have a full roll cage, a steering system and room for five people. “The record speed is 82 kilometres an hour. The average is 50,” says Lowe, adding that just finishing the course is considered an accomplishment. Dutil says one of the challenges faced by the Okanagan team is starting from scratch, both with team members and the sled itself. The team is a multi-disciplined effort with engineers from different areas of study pooling their knowledge and expertise for the challenge. Other team members are Tim Abbott, Ryan Blackmer, Dustin Creviston, John Fisher, Jonathan Greening, Julia Halipchuk, Devin Hebert, John Hillis, Will Horne, Matt Mendes, Brian Shewchuk, Aly Stout and Benny Tseng. 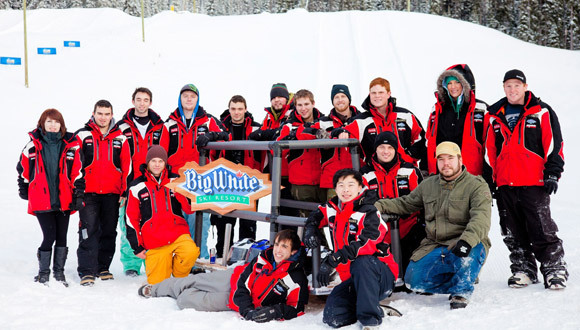 Students from the UBC's Okanagan campus School of Engineering give their concrete toboggan a push while testing it out at Big White.